Sanda is an exciting and fast-paced combat system which relies on calisthenics and various workout routines to get the practitioner into peak physical shape while using drills and effective fighting combinations to give them the tools they need to fight and to win. It is an excellent system for fighting and self-defense as well as an incredible workout system for those searching for exercise with purpose. Sanda literally means free-striking or free fighting and is the national combat sport in China for martial arts fighting competitions. Originally created in the 1920s, it was used by the Guomingdang (Nationalist Party) for the training of its soldiers in hand to hand combat. After the Communist takeover of China, Sanda was adapted for the modern soldiers. In the current age, it has become the major combat sport in Chinese competitions. Sanda employs the three major ranges of combat: kicking range, striking range, and the take-down range in its use of techniques. Though traditionally not considered a “style” unto itself, it is the culmination of all the systems of Chinese combat for use in competitive fighting. At the academy, we focus on the first two ranges for the Sanda class and save the takedowns primarily for the Tuishou class. Our methodology of Sanda comes from Grandmaster Ma Jie who was renowned for his fighting skills. This methodology fuses the five element theories and 14 striking methods of Xingyiquan with the fluid stepping patterns of Baguazhang and the Ting Jing , or energy sensitivity training, techniques of Taijiquan. Our Sanda approach follows the striking components of typical sport Sanda, but adds to it our 9 palaces methodology. This employs the use of the elbows, shoulders, knees, hips, shins, forearms and head in addition to the hands and feet. Furthermore, here at the academy, we draw from the traditional systems to explore more unique methods of striking. Beginning students will learn to use their hands, and later their feet, for striking, kicking, defensive and offensive maneuvers and closing the gap in a fight. They will be trained in all the basic strikes and kicks and learn to use them with the use of kick shields, focus mitts, and heavy bags.Beginning students will also have the opportunity to practice defensive and offensive drills with a partner with light contact. Intermediate and advanced students will continue where the beginning students leave off by delving deeper into the striking and kicking combos and exploring the more vicious techniques contained in our Sanda. Students will typically have the opportunity to engage in live sparring on mats and use all the techniques at their disposal. 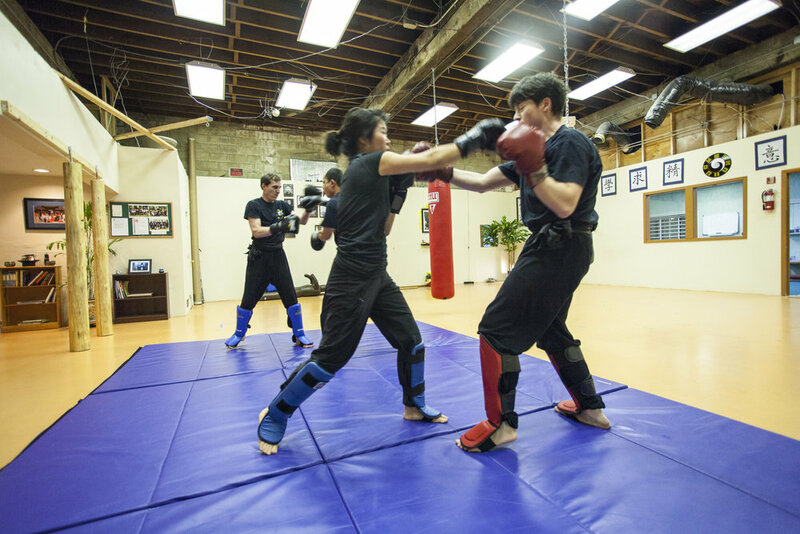 In order to give students a more challenging experience and to better prepare them for self-defense situations, students will also have the ability to engage in multiple opponent sparring. For those students who are interested, competition experience will also be available.